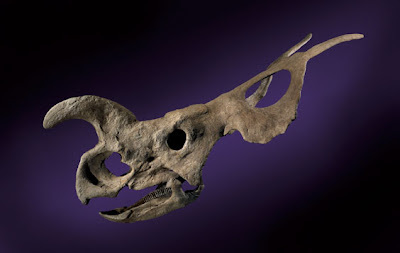 When most people think of a horned ceratopsian dinosaur, only the common three-horned Triceratops comes to mind. This could be because triceratops is such a frequently-encountered and wide-ranging dinosaur, or because its long history of discovery gives it better press in children's dinosaur books. But this would be a real disservice to the exciting, but less common, cousins in the centrosaurinae (short frilled) branch of the ceratopsian family. One rare member of that subfamily is the Sioux 'buffalo lizard' or Einiosaurus, intriguing enough to merit inclusion in the 1997 USA 'World of Dinosaurs' postage stamp issue. Einiosaurus has a very unusual morphology, with a tall and laterally-compressed skull and a frill with a somewhat inward curve that gives it a distinctly vertical appearance.